Once again, Mr Minx and I decided to avoid the crowds dining out on Valentines Day and cooked dinner at home. Earlier in the week I had received an e-mail from a cookware supply site that touted fondue pots and remembered that we had one at home that we had never used. 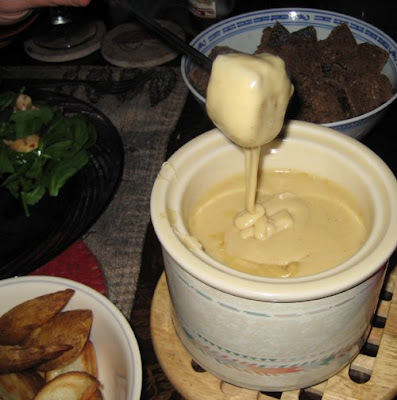 I forwarded the e-mail to my hubby, "How about cheese fondue for Valentine's day?" Sounded good to him. And for dessert, he wanted something tart-like, in a crust. "We have lots of apples in the crisper," he added, to entice me. I had been wanting to try making tarte tatin for a while, and this seemed like the perfect opportunity. First, the fondue. Rather than buying a whole bottle of kirsch just to use a couple of spoonsful in the traditional cheese fondue recipe, we used beer instead - about half a cup of Leinenkugel Fireside Nut Brown. The beer was brought to a boil and then several handsful of a combo of grated Emmental and Jarlsberg cheese was added (about 2/3 lb) which had first been tossed with about a tablespoon of cornstarch. The fondue pot we received several years back went unused - it needed fuel which we did not have and did not care to purchase at the moment. I did, however, have a mini crockpot, which worked just fine to keep the cheesy goodness warm. For dippers, we used chunks of pumpernickel bread, baked potato wedges, chunks of salami, and poached shrimp. Spinach salad and cornichons added a nice bit of vinegary bite to balance the rich cheesiness. As for dessert...the tart came out very well, except it was a bit juicy. I don't have a large cast iron skillet, so used our trusty oven-safe 9" non-stick. Because it's smaller, I used only 5 apples and most likely did not cut back enough on the amount of sugar. I probably could have crammed another apple in the pan though, since they shrunk quite a bit after they spent some time in the oven. Next time.... Tasted great though! And apart from peeling and quartering the apples, not really any effort at all. Cook apples over moderately high heat, undisturbed, until juices are deep golden and bubbling, 18 to 25 minutes. Don't worry if juices color unevenly. With a little bit of melted cheddar for a bite :) I (weirdly) love melted cheese on my apple tarte tatins. I'm going to have to try the tarte tatin one of these days!